1. Preheat the oven to 180˚C, gas mark 4. Grease and line the base of 2 x 20cm sandwich tins. Toast the peanuts in a dry pan over a medium-high heat, tossing regularly, until golden (about 4-5 minutes). Set aside and wipe the pan clean. Gently heat 75g honey and 75g muscovado sugar in the pan until dissolved. Cook over a medium-high heat, without stirring, for another 2-3 minutes, until you have a rich, golden caramel. Toss in the nuts, coating them with the warm caramel, then pour onto a sheet of baking parchment. Allow to cool completely, then chop, blitz in a food processor or bash with a rolling pin in a sealed sandwich bag until coarsely ground. 2. Using a fork, roughly mash the 4 bananas with the lemon juice. Cream the butter with the remaining 125g muscovado sugar and 25g honey until fl uffy, then beat in the egg yolks, peanut butter and mashed banana. Add the fl our, baking powder, salt and ¾ of the caramelised peanuts. In a clean bowl, whisk the egg whites to stiff peaks using electric beaters, then fold through the cake batter until evenly mixed. 3. Divide between the tins and bake for about 30 minutes, or until golden, risen and a skewer inserted into the centre comes out clean (cover with foil if they brown too quickly). Cool in the tin for 5 minutes, then transfer to a wire rack, removing the parchment, and cool completely. 4. For the buttercream, use electric beaters to gently beat together the butter, peanut butter and icing sugar, then increase the speed for 2-3 minutes, until light. Whisk in the cream and a pinch of salt. 5. Transfer 1 cake to a stand and spread over the caramel or toffee sauce. Top with banana slices, followed by the softly whipped cream. Sit the other cake on top and spread with the buttercream. 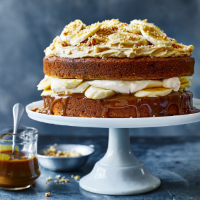 Decorate with sliced bananas and the reserved caramelised peanuts.